The girls and I presenting to Dena Sherwood founder of the Arms Wide Open Childhood Cancer Foundation and the creator of The Truth 365. Also pictured is Dena’s son 7-year-old Billy who is also a childhood cancer survivor (5 years NED neuroblastoma)! I ADORE the Sherwood family! Because of all of you and your HUGE hearts and your kindness, EVERY, SINGLE, SOLITARY dollar of that money will go towards funding childhood cancer research!!! And for those of you who are new to our fundraiser, I don’t just mean every dollar on our end (that’s a given)…but on The Truth 365’s end as well…NOTHING is taken out for administrative purposes or salaries, how amazing is that?! Just like last year, it’s going to take some time before we know exactly what we’ll be funding, but the moment I’m able to share the news with all of you I will fill you in (last year the process took about six months). It’s important that the proper time be taken to review all grant applications (not by us of course, I’m talking about by some of the childhood cancer community’s leading oncologists)…this way we know that only the best trials with the most potential will be given our donations. In other words…EVERY DOLLAR COUNTS! As some of you already know, my own personal goal is to raise at least $100,000 each year supporting a different childhood cancer each time (there are 12 major types of childhood cancer). Last year the $110,000 we raised helped to fund 6 trials with the main focus being on AML leukemia. That is NOT the type of leukemia that Natalie has (she has ALL), however it’s the one they know the least about therefore the survival rate isn’t good. This years $164,326.03 will be designated for Ewings Sarcoma research in honor of our sweet Julianna who died a little over a year ago. Let me just say that had it not been for the AMAZING community where Julianna lived, we would have NEVER made it to $164K! I don’t know exactly how much the Woodbury/Monroe communities raised, but from Julianna’s school, to the local Cub Scouts, to the swim club, the local pediatricians office, and MANY, many more…I’d have to bet that in the least they raised over $20,000! 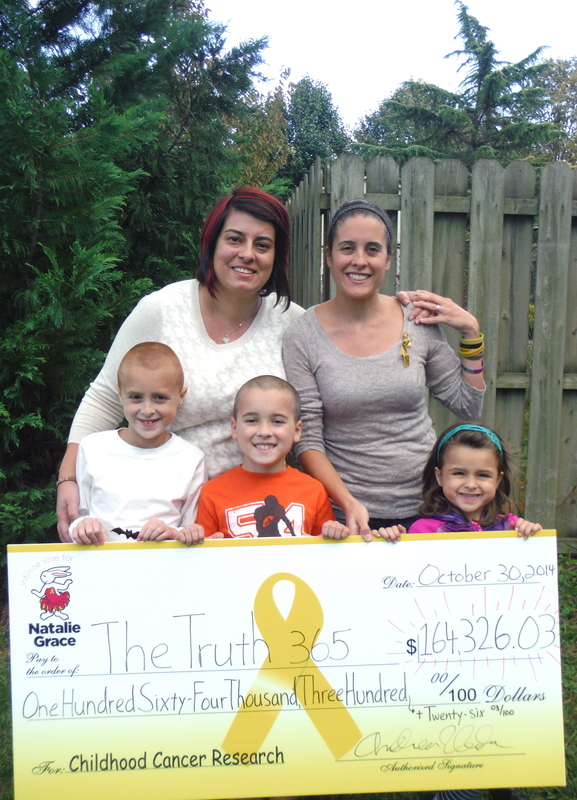 Each of them could have donated directly to The Truth on their own, however it was important to Tina (Julianna’s mom) that they go through our family to make sure that we made it towards our goal of $150K. 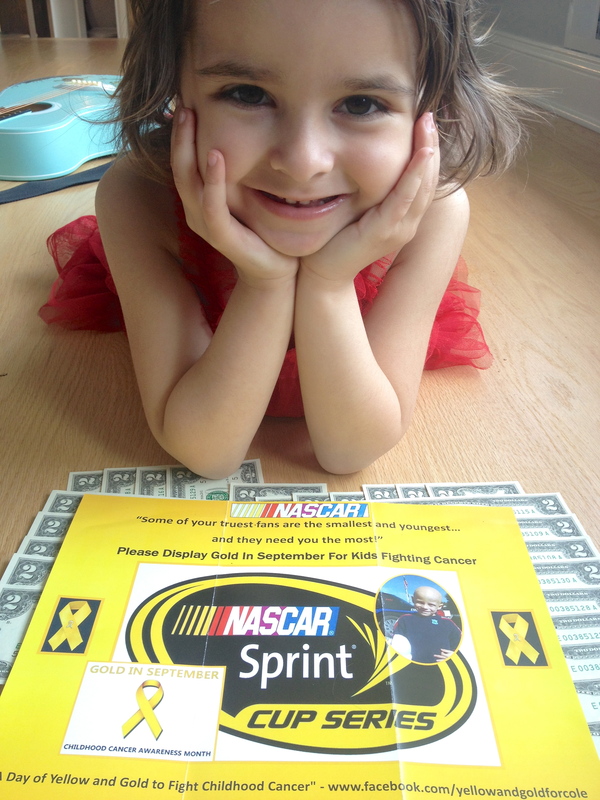 She didn’t ask that they do this because I was earmarking the funds for Ewings Sarcoma research to honor Julianna, but because if Julianna were alive today she would have insisted it go to us simply so that we could meet our goal. In fact, last year when Julianna was alive for our fundraiser, she donated her own money along with some valuable personal items for me to auction off to put towards our fundraiser as well…Julianna by nature and nurture has always wanted to help others (in so many different capacities)…and she is still doing it today. This photo is actually from our fundraiser last year. 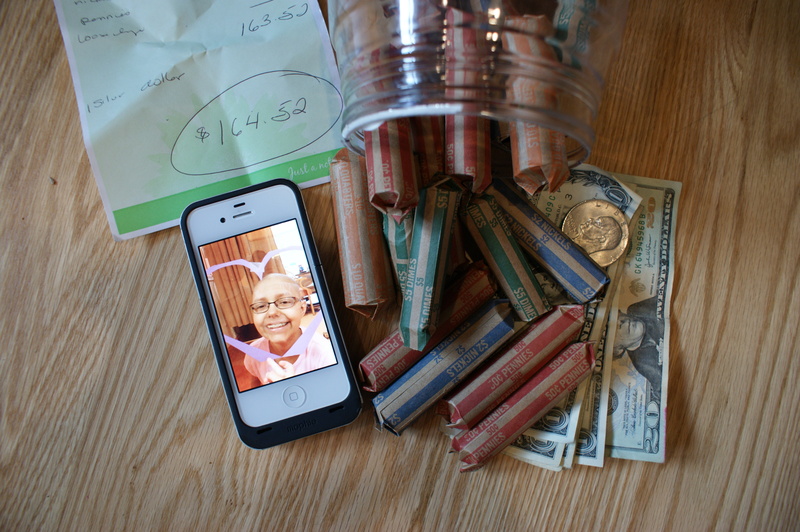 This bank was donated by Julianna and her family, and the inset photo is of Julianna while she was stuck in the PICU. I wanted to include this photo since at least $20,000 of this $164K raised was donated in her honor by hundreds of amazing people in Julianna’s community! I will never, ever, ever be able to thank you all individually…but please know that I don’t take a single donation for granted. Each piece of mail is just as exciting as the first. I keep EVERY single letter/note that we receive…in fact they go into binders so that when I’m feeling as though I need a little inspiration to keep fighting (we all have our hopeless moments), I can flip through your beautiful messages to get an instant pick up. 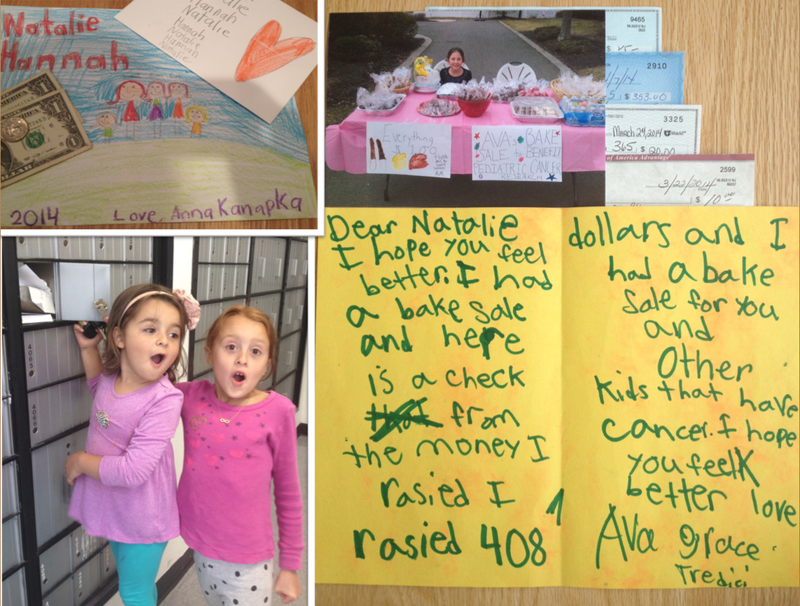 So THANK YOU all…..THANK YOU for holding those lemonade stands, those garage and bake sales. 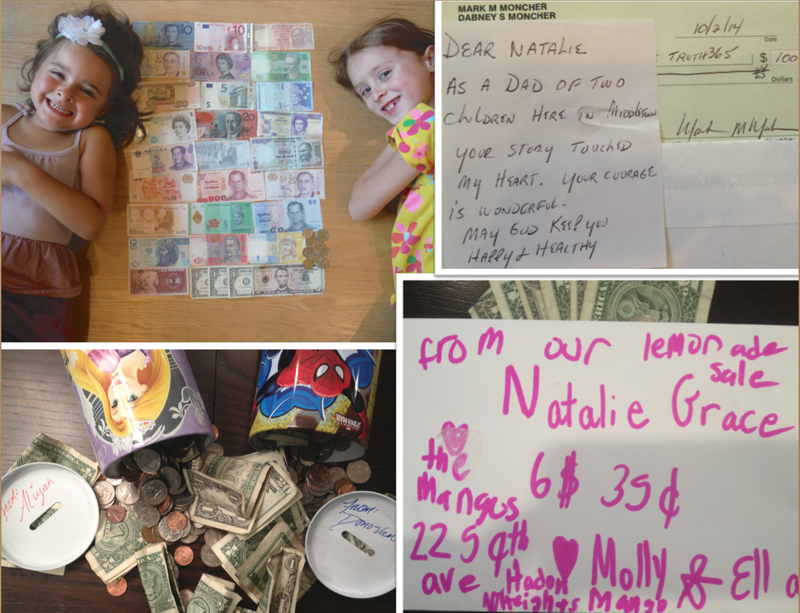 Thank you for your tea, coffee, wine, birthday and Halloween party fundraisers…thank you for your poker runs, your princess, balloon, and music parties. 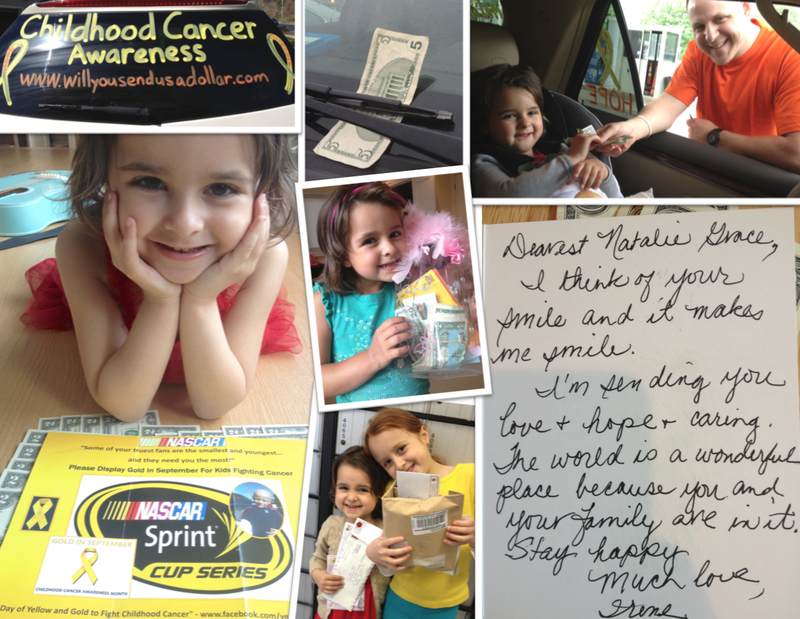 Thank you for thinking of us when you sold your CAR, when you received your bonus at work…when you ran that 5K! Thank you for hosting one of our MANY change containers at your restaurants and other places of business….thank YOU for giving us some of the proceeds of your business sales…for attending one of our MANY fundraisers, for being a sponsor, for spending your hard earned money over and over and over again. Thank you for the gifts + gift cards that we used at one of our many auctions, thank you for VOLUNTEERING your time to help this crazy lady (me)!! Thank you for being as passionate as we are about helping these amazing kids and for helping to put an end to childhood cancer. THANK YOU for recognizing that any one of you can be pushed into our crappy boat at any time, thank you for associating with our lives, for listening to our stories no matter how sad, for learning and for passing this valuable education on to others….THANK YOU for joining our fight and for never EVER giving up!! It might not be around the corner, but until there is a cure, we WILL find better ways to treat our children….ways that are less toxic, ways that wont damage their little bodies further, ways that won’t kill them….ways where they can still be a kid, where they won’t lose their hair, where they won’t have to take up residence at a hospital, where they can go to school like every other healthy child and simply laugh, play and love life without a care in the world. THANK YOU from the bottom of my heart for all of your small gestures that are actually big ones to me…like inviting me to speak at your events and offices…and for reading, liking and sharing my posts…your endless support means more to me then you will ever know! As you can see, the girls LOVE getting the mail from our P.O. Box…this day it was stuffed which hasn’t happened too often so they were REALLY excited by how much mail we had gotten. I’m dreaming of the day where there’s nothing in our P.O. Box except a slip of paper telling us we have a package…only instead of a package waiting, it’s a whole sack full of mail!! Maybe next year will be our year where that happens! Please keep in mind that while the 2014 Will You Send Us a Dollar campaign is technically over…my family and I will NEVER stop advocating or fundraising. Our P.O. Box and our donation site are ALWAYS up and running. So by all means, if at any point you’re feeling extra generous and would like to contribute to our 2015 goal (which will officially start up in April), then feel free to send a donation our way! It would be AWESOME to start next year’s fundraiser with money already put towards our goal to help fight childhood cancer (as always via The Truth 365). So thank you in advance for thinking of us!! You all should be SO proud of everything that you did, everything that your kids did, your community…all to help us reach that goal and more importantly to help these kids!! Just think, last years fundraiser ran for 5 months and we raised $110K in that time. 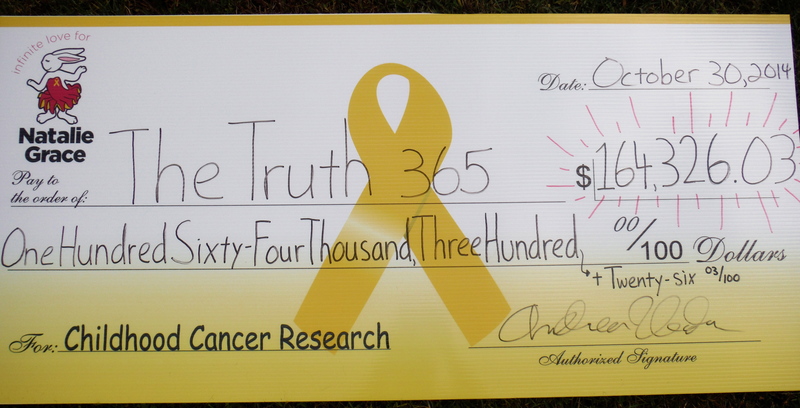 This years ran for 6 months and we raised $164K….so in less then a years time, we’ve raised $274,326.03 for The Truth 365!!! Pretty awesome considering we have no staff and rely solely on the generosity of all of you! Our love and appreciation to you all ALWAYS. Thank you for loving our family like your own! Combining this check with what we raised last year ($110K)…we have raised $274,326.03 for childhood cancer research in less then a year!! I can’t wait to see what 2015 brings!! THANK YOU everyone!! I I always paint my car’s windows when we’re doing the fundraiser, you’d be surprised how many people stop to hand us a donation, or simply stick a dollar or two under my windshield wiper…it’s pretty awesome!! Although, since our house was broken into this past summer and we’re pretty certain we were targeted (because of the fundraiser), I’m thinking my car window painting days might be over…but we’ll see! So proud of you! We look up to you guys and hope to one day make as big of a difference as you all have! Instead of painting your window, what about getting removable door magnets? That way you can “advertise” but keep your family and your home safe. This is so phenomenal, Andrea!